Like a lot of you, I have a slight addition to Pinterest. Niels used to tease me about it, but he's now enjoyed enough new delicious meals and put enough good tips into practice that he is happy to let me go off to that happy place. I'm not sure how I managed to get onto to Pinterest so early, but I've been a regular on the site since July 2011. Several times since then I have had to re-organize boards into sub-categories. My "Culinary Creations" board, for example, has now been broken into seventeen separate boards, such as chicken, sweets & treats, eet smakelijk (Dutch food), kids, crock pot, sides, No dairy for D, soups, DIY condiments and mixes, and good mornings. I also have boards for each room in our house, each month and season, going green, projects to do with my preschooler, and wish lists for each member of our family. Of course, I also have a board with photos from my posts here at the de Jong Dream House. And then I have a hodge podge board I call Projects. This is my collection of things I think I can actually do. Last year, our main project was to finish our house, move in, and get settled. This year, our goals are slightly less ambitious as we relax a bit and enjoy everything we did last year. My main goals are to learn to sew and figure out my new Cameo. 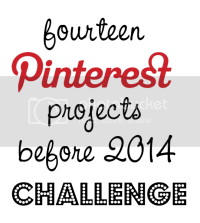 So today, I browsed through my Project board and came up with 13 Pinterest Projects in 2013. Here they are. If you've done any of these projects, let me know how they turned out and if you have any tips. Please note, the photos belong to the bloggers credited under each photo. Please pin away, but pin from the source, not here, and give proper credit where credit is due. /end public service announcement. 1. Unpaper Towels. We haven't used paper towels in a few years. I have two drawers of cloth towels that we use (the pretty ones and the stained ones). But I these would be nice to have out when we have company (like my Mom) who are always looking for paper towels. Plus, it will be a good first sewing project for me because if I mess up, hey, they're just rags! There are several versions of this on Pinterest, but I chose this one because it uses velcro instead of snaps. I didn't want to have to buy another tool for my first project. This will be my first project because my awesome friend Nicole has offered to teach me to sew. Yesterday we went to Joanns and picked out supplies. 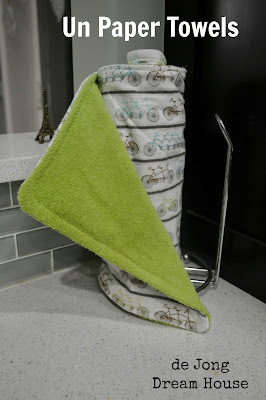 It's hard to find grayish-greens like our backsplash, but I have enough of this lime green that's so popular right now that these will be a fun fit. I love the bikes. Very fitting for a Dutch household. 2. DIY Pocket Hand Warmers. Another easy project--I hope. And a great one for winter. 4. 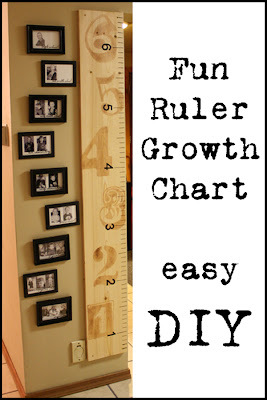 Ruler Growth Chart. There's a little sliver of wall in D's room that would be perfect for this. I saved a piece of wood from construction that is just the right size. I think this will be a great first Silhouette project. There are several of these rulers on Pinterest, but I like this one because of the idea of putting photos from each age alongside it. 5. Reusable Snack Bags. Several months ago, I saw one of these in a store and will forever kick myself for not getting it. It was very similar to this, except it folded out to make a placemat. I think it's easier to clean, as well. I finally found some similar ones at a craft fair and bought two. I love them. As D spends more time in school, I will definitely want to add to my collection, and now that I'm going to me an accomplished sewer (ha! ), I will make my own. 6. Stacked Letters. I will be adding a glue gun to my craft collection this year. 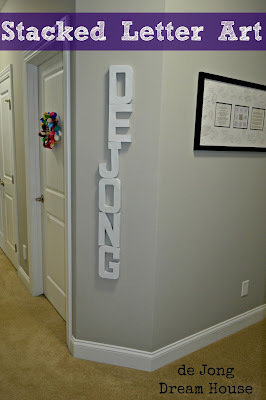 My first project will be do make a "de Jong" stack for the corner of our great room. I think I may paint the letters silver or purple. 7. Big Blown Up Black and White Photo. Here's a secret. Staples, etc. will print large black and white photos for cheap. They're called engineer prints, can be up up 3'x4', are are less than $10! I have a couple places in mind for this, either Niels' office or our guest bedroom. The hardest part will be figuring out which photo to use! The Real Housewives of Bucks County, now known as East Coast Creative, as a guest post on Infarrantly Creative--Whew! 9. 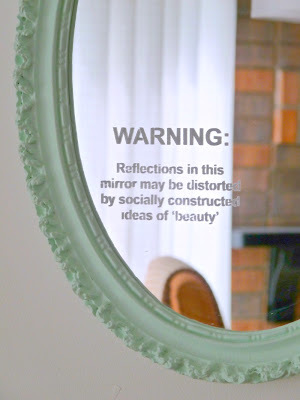 Stencil Mirror Message. One of the "fun" side-effects of my brain injury meds is that avoiding weight gain is a constant battle. I am beyond blessed by the way my hubby makes me beautiful no matter what the scale says, but it's always good to have this reminder. Niels isn't in love with this. He likes the sentiment, but not the execution.My project will be to combine these two messages. Instead of "warning," I'll use "Imago Dei," which means "Image of God." Under that, I'll put the "Reflections...." part. Not sure if I'll spray paint like the above pinner or do vinyl like I've done in my son's room. (He has "You are Loved.). 10. 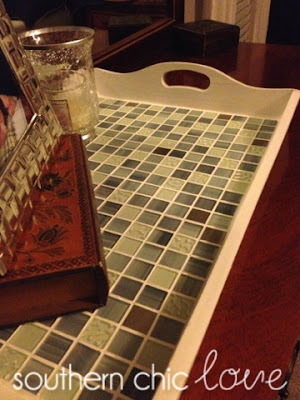 Upcycled Tile Tray. I love the backsplash tile in our kitchen. We have a few 12"x12" leftovers and I think this would be a great use for one of them. Now all I need to do is find an old wood tray at a thrift store. 11. 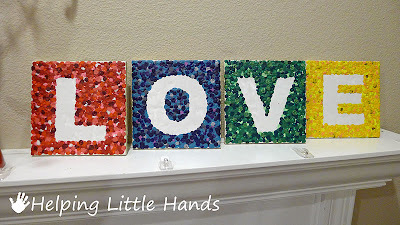 Melted Crayon Word Art. I think this is a fun way to use up old crayons. I'm thinking I will do "PLAY" for the play room. 12. Chipboard Canvas Art. As a former writer, I suppose it isn't a surprise that I love word art. I'm mulling over text ideas for something in our bedroom. 13. Modern Family Tree Art. This is one of the coolest things I've seen. I'm not sure if I'm artistic enough to pull it off, but I'm sure gonna try! There you have it. My 2013 Pinterest challenge. What pins are you going to do this year? I have pinned some of those same things! Maybe this is the year we'll both get it all done! Most of the pins I'm excited about involve my new Silhouette. So excited to have found a Silhouette buddy in you! We'll have to share tips and tricks with each other as we come across them. oh my goodness. That is SO cool! I love the bird, too. I can't wait to see what else you come up with! Love your ideas! My aunt had me cut the "So happy you're home" out on the Silhouette so she could do the same thing! This is a great round up! 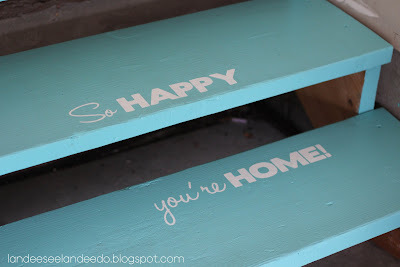 I love the painted garage steps (I definitely want to do that) and the hand warmers are so cute. I'm so flattered you included my project in your round up. I can understand how difficult it must be to handle weight gain from medication. Even if we're okay with our bodies, that lack of control over one's body can be really difficult to deal with. But you sound so strong - such an inspiration!! What a sweet thing to say. It's much easy to keep a good attitude about it because I have a hubby who is so supportive of me. I especially love the stacked letters! Funny you should say that. I've had them glued together for weeks, but it was finally nice enough outside for me to paint them yesterday. Hopefully they'll be on the wall and posted about in the next week.